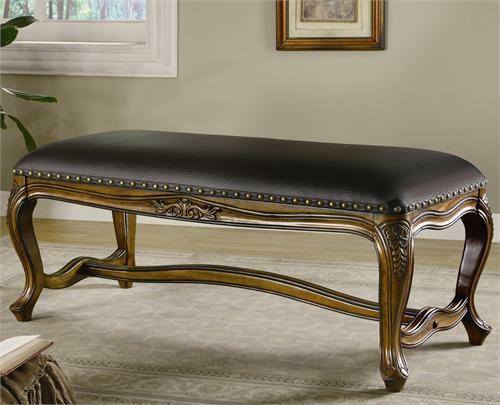 A leather like black vinyl contrasts beautifully with the traditionally styled base of this upholstered bench. A center stretcher binds the base together and echoes the classic curves of the bench's legs. The generously proportioned bench seat is upholstered in a subtle and durable black vinyl that recreates the luxurious look of leather. Individually placed brass colored nail heads trim the seat for a tailored look. A medium golden finish bathes the base, accentuating the carved floral motif featured on the cabriole style legs.